Workgroups or small departments in companies needing a fax machine, copier, printer, and scanner will find the all-in-one Oki MC851cdxn a suitable solution. With just one unit, they can already get good quality output plus it even comes with Ethernet for easy networking. The Oki MC851cdxn A3 colour laser printer has high paper handling capacity and a monthly duty cycle of 60,000 pages. This large printer is quite pricey and it does not have Wi-Fi. The Oki MC851cdxn printer measures 84.5 x 76.6 x 113 cm and weighs 100 kg. This unit has short cabinet plus 2 additional paper trays to handle a total of 1,460 sheets. 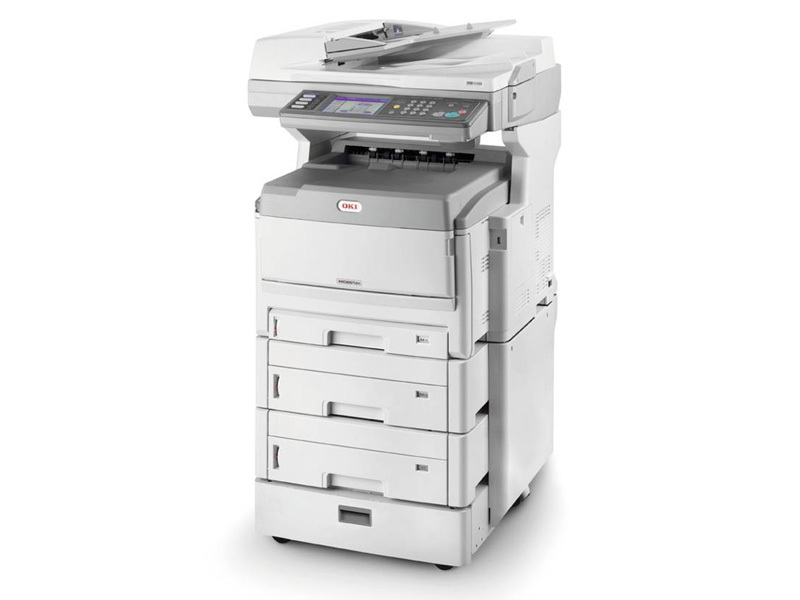 The Oki MC851cdxn colour laser MFP features a 14.5 cm touch-screen LCD display and a duplexer. For connectivity, USB and Ethernet ports are on the back and an additional USB for flash drives is on the front. Print speed can go as fast as 34 ppm for monochrome and 22 ppm for coloured prints on size A4 media. The black Oki MC851cdxn toner offers a yield of 7,000 pages while the colour cartridges for the MC851cdxn can print up to 7,300 pages. This robust machine can handle high-volume printing needs; the MC851cdxn delivers excellent print quality at relatively quick speeds. Scan, copy, and fax quality are also good. The Oki MC851cdxn multifunction printer has scan-to function - it can send scans to networks, a PC, or a flash drive. Both Macintosh and Windows computers will be able to use the Oki MC851cdxn all-in-one colour printer. Expect this unit to be a bit pricey. The Oki MC-851cdxn laser printer does not have Wi-Fi, so it cannot be shared with multiple users.